Good websites of all shapes and sizes usually have one thing in common, great content. Whether a site is new and still growing, or well established and expanding it’s readership, exposing interested parties to your content is key to attracting new visitors to your site. However, many are toiling away without key secrets for sharing content. These ethical tips could quickly expedite many of their efforts and generate more ad revenue and more web traffic. The term ethical is a really important distinction here. As most sites are aware, earning good quality visitors through an ethical means is the most sustainable way to grow a site’s following. Shortcuts and other blackhat methods of traffic attraction can be short-lived and short-sided. To grow a sustainable site that generates growing ad revenue, you will need to find proven, ethical ways for sharing content. Below, I’ll highlight some ways that I have used (and seen other top publishers use) to dramatically increase traffic in less than 30 days. These methods can be used for both long-term and short-term growth. Ultimately, these ways of sharing content can be a valuable investment of any site owner or publishers time. If what you’d really like to learn about is getting your old content to rank higher organically (click here), or if you want to figure out how to make posts that rank higher in search engines initially (click here). Otherwise, continue reading. I’m going to skip past all the stuff about why sharing content ethically is important and why you should avoid nefarious or short-lived methods for spreading your content. I’ll just assume you’re reading this because you get it and want to learn some cool new ways to expose your content to valuable readers. The key to sharing content ethically — especially in the beginning — is increasing your chances of gaining valuable backlinks and pockets of new users. 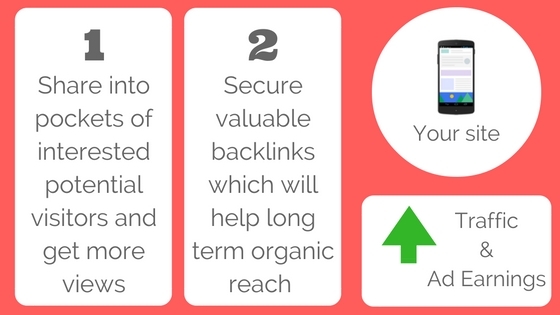 Why backlinks? Those can have powerful SEO benefits and can actually offer quite a bit of benefit down the road. You see, this entire strategy is based around getting your content shared quickly with as many people as possible and securing backlinks that will boost a pages SEO enough to where you will see consistent visitors organically for months/years to come. To execute this perfectly, you will need those pockets of visitors I described earlier. 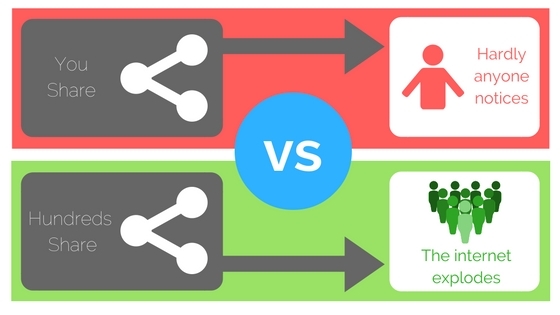 Beyond the backlinks, you want real visitors to come across your content to view it and to share it. The more places you can place this content, the more opportunities you will have of this occurring. Additionally, you can expect that certain outlets for sharing will provide more value to certain types of your content than others. The key is to learn these intricacies as you go and to be sensitive to any communities that may view your constant sharing as spam (you don’t want this, trust me). Everyone is probably already aware of the power of social media, so nothing would probably bum you out more than for me to say that you should share your content on Facebook, Twitter, LinkedIn, and Pinterest, right? Well, I won’t disappoint you. You should do these things; however, they are only worth doing if you are going to do it effectively. If all you do is share the link along with some catchy text on each of these networks you might as well just place chess in the dark by yourself. New sites will see almost no growth through these networks doing this stuff, and well-established sites will just simply get the status-quo from these results. It’s really important to understand right off the bat that each of these platforms use algorithms and data to determine how each of your posts is delivered to a set audience. The impressions that your content receives on these networks are almost always tied to CTR and engagement metrics. This means that your ability to control how people interact with your content will directly determine it’s success on that platform. 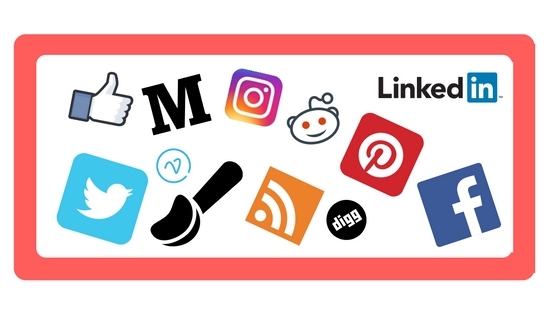 Here’s how you get the most out of each of these social media platforms. Ah yes, where organic link sharing has all but died. You may have noticed this on your own, but any external links shared on Facebook get next to no organic impressions (especially compared to years past). While the rise of Facebook instant articles has provided an alternative that provides some form a solution to this problem, it requires a totally new approach to your publishing strategy (namely hosting your content on Facebook). It’s probably not a proactive part of most strategies right now but I thought it was worth mentioning in case you wanted to research this further. 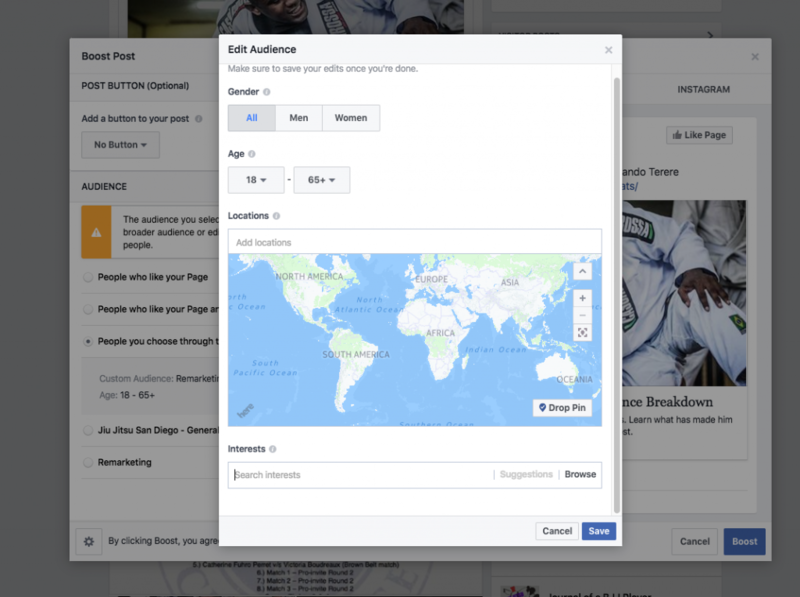 If you really want your Facebook posts to reach more of your audience, there are a few things you can do. First, make sure to write something compelling with your post. Next, add your own images to the update (the default one pulled from the meta data is likely not what will engage readers the most). It’s also worth adding multiple images for an image carousel if the content lends itself to that kind of visual appeal (I’ve seen stats that say carousels do better on average). Next, try to work with a network of friends and other peers to share, like, and comment on all of these updates. This is big. Facebook, like Instagram, will give posts a boost organically if their CTR’s and engagement metrics are strong. Pushing this along manually and through networks is a great way to get the most out of organic posts on Facebook. 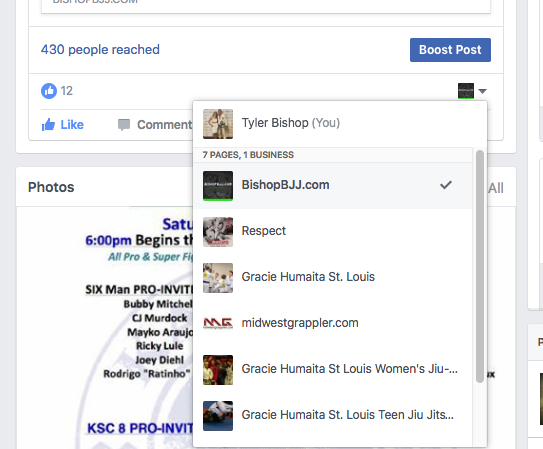 This can be great if you manage multiple popular pages (or start multiple pages) that can share similar content. Twitter will always have a soft spot in my heart. I was a very early user to the platform and have seen it change dramatically over the years. It’s newer algorithmatic approach to timelines has been one of the most significant of those changes recently. This means, like Facebook, Twitter is altering user timelines to show them what the platform feels is the most relevant content for them. 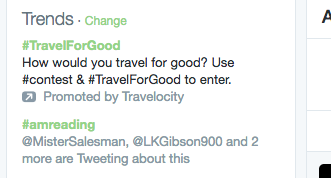 This makes it slightly harder than it used to be to reach new visitors on Twitter, so if you haven’t changed your Twitter strategy in a while, pay attention. Twitter is still a very effective way to reach audiences; as tweets can show up in search results and RT’s are still a genuinely powerful form of virility controlled by platform users (which means if your content takes off, the platform itself will not stand your way of thousands viewing it). The truth is most people don’t tweet enough. They also don’t try enough hashtags, variations of their post texts, or take advantage of images. 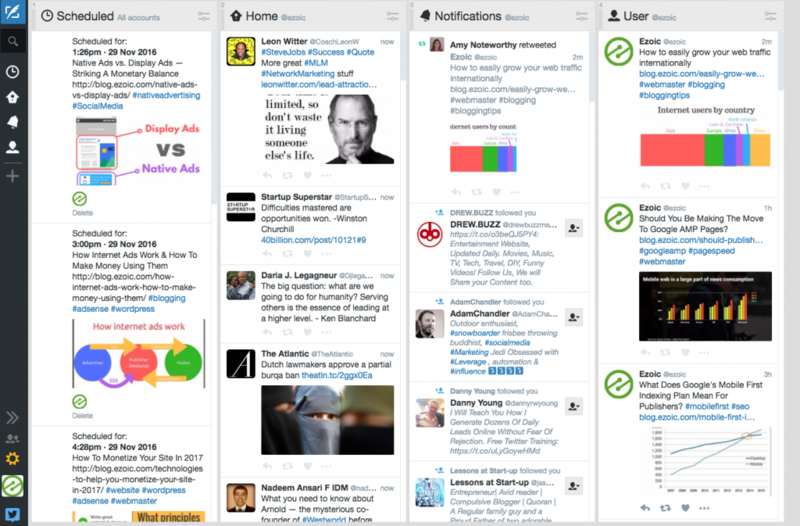 You can see above a screen shot of my Tweetdeck (free tool, btw). I keep this thing locked loaded. I take my top 15-20 most recent posts and schedule them in a loop (approximately 1 tweet every 1.5 hours) for days. Each post may include a slight title variation and will always include different hashtags. I also ensure that I add my own image to the posts as well (as it has been proven these get more impressions and clicks on average). Every time I publish a new piece of content on my blog, I take one of the posts out of my Twitter rotation and insert the new one into it. This ensures all my pieces of content get exposed on Twitter about a dozen times; with different titles, images, and hashtags; thus maximizing their ability to get shared and exposed to influencers and popular platform users. 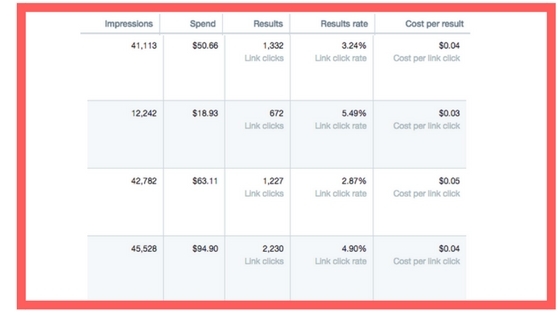 Like Facebook, Twitter also offers very cheap CPM’s and CPC’s (actually better than Facebook). It may be worth it to create a campaign of your best blogs and sponsor your most successful tweets of that content. After you’ve posted each a number of times, you’ll know which ones do the best and are worth spending money on. Twitter has some excellent targeting features and you could hit a nice niche audience pretty hard with your best content for less than $50 in many cases. This strategy can worth well if you think your content is shareable or has a high number of pageviews per visits as a landing page (this has good SEO implications). LinkedIn is a little different from all the other platforms we’re discussing; as it is a large niche network. It is designed for professionals. It’s quite possible that most of your content is not friendly or appropriate for professionals. However, there are probably some secret pockets worth exploring. One thing you can do regardless of whether or not your content is always appropriate is create a business page for your site. This will allow you an outlet to post your content even though there might not be anyone to view it yet. As you will see, there are probably some places your content will go here, and accumulating business page followers is a slow, but effective, way to secure a handful of visitors with every new piece of content you publish. Beyond sharing your content on your site’s business page, there are millions of groups on LinkedIn in. 99% of these groups probably don’t care about your content. However, there are tons and tons of niche groups. You might be surprised at the size of some of them that exist. You can join up to 50 groups at a time. Some require moderator approval. Many have groups rules as well. It’s very important you follow these rules, only share relevant content, and participate in group conversations. If you fail to do these things you can get blacklisted from all LinkedIn group participation; which pretty much kills all the value of the platform. 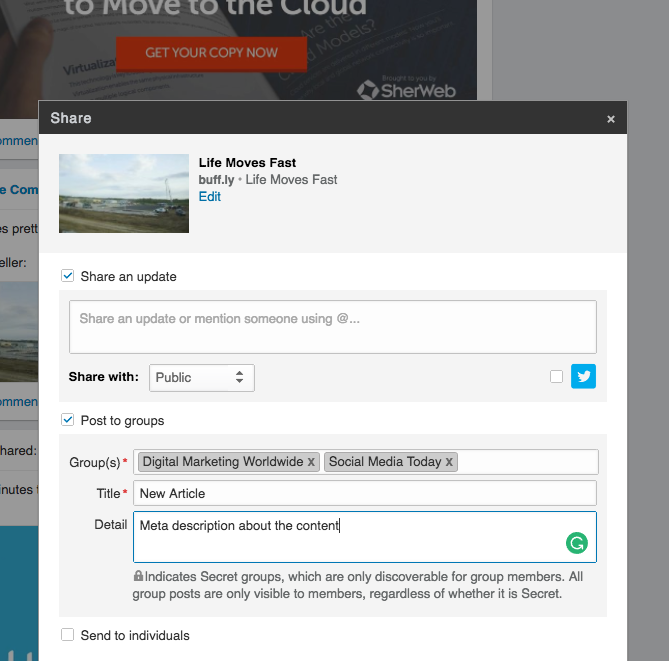 Above you can see how to search for groups and how to share content into them once your content is live. This strategy can deliver big results. I have commonly seen sites add hundreds of visitors a week through this method. For some of you that may not be a lot, however, consider that these are high value, free visitors that took you less than 5 minutes to get. I don’t recommend LinkedIn’s paid services for most publishers. Their costs are exponentially higher than Twitter and Facebook and rarely offer the returns that those other platforms can in terms of virility and exposure. I won’t dive to deep into this strategy since we covered it very comprehensively here. 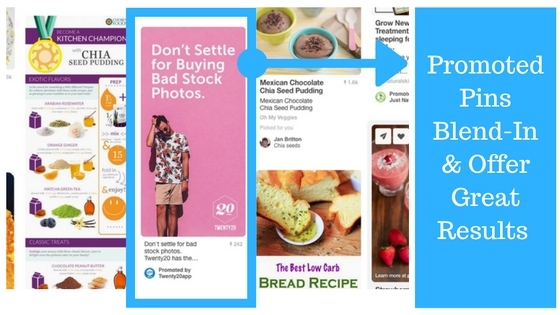 However, I will say this, Pinterest is probably way more effective than what you think it is. The exposure you can get on Pinterest is really very incredible. The competition is often much lower too. The paid proposition they offer for content is the best of the four networks we’re discussing and definitely worth exploring with a few extra bucks. Where else can I put my content? There are a number of strategies and outlets you can use for content sharing or marketing. To get everything in one post would be pretty tough (and hard to read), so what I decided to do is list the places I have seen some of the biggest returns from below. You’ve probably heard of Reddit, maybe you’ve shared there before, maybe even you’ve been scared off by some bad moderators or rabid posters. Nevertheless, it is a goldmine when used properly. Reddit is unlike any other place you will share your content. It is an authentic and genuine place. People just looking for blog or website clicks will be quickly labeled as blog spammers and shut out of any meaningful use of the platform. With that in mind, understand that it is an almost certainty that there is a good place for some of your content on Reddit (probably several). However, you have to become a platform user and a subreddit contributor if you truly want to get the most value of out of this platform. By the way, subreddits are the way Reddit organizes it’s forums by theme (in case I left that out). I share content from several sites that I maintain across approximately 6-7 different subreddits. I am active in every one of those forums. Prior to ever posting my content, I try to contribute any knowledge I have to other posts and generally participate in discussions. This gives me a better idea of what types of content are most appropriate for these groups too; which makes my content posts much more effective. Now, you may think that all this participation is simply a means of paying dues to post content. This is not true. Your participation is the development of credibility that will increase the effectiveness of your content. Your posts are much more likely to get upvoted, clicked, and listed as a hot topic if the community as a whole appreciates your contributions as a forum member. Now, there are a handful of other places I like to share my content, simply because they are easy and have few strings attached. Scoopt.it is an easy place to curate your content. Once you have an account set up, you can simply use a Chrome extension to share on the platform. This makes it very easy to use. I have seen some sites add hundreds of visitors a day through Scoop.it. 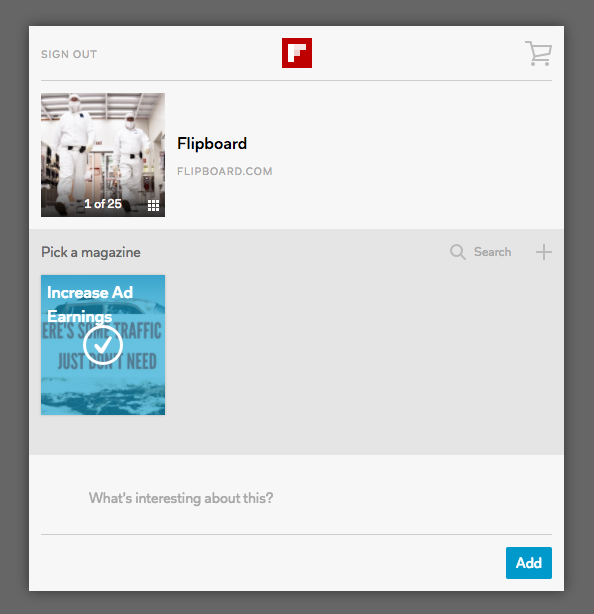 There are a couple places like Flipboard online, but I appreciate the simplicity of the curation network. They also have a Chrome extension, and allow publishers to organize their content relevantly by “magazine”. This gives you the ability to target different content to different people. I like that once I publish new content I can simply click my Flipboard extension key and it is shared in less than 10 seconds. Another place that is painfully underused by content producers is StumbleUpon. 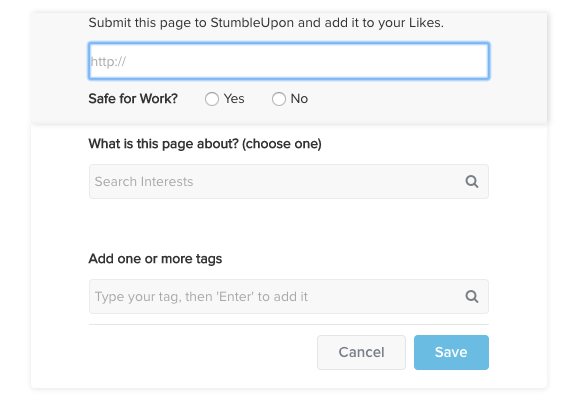 It is very easy to setup account, add content, and tag your content for relevant audiences on StumbleUpon. The platform does not have a massive userbase but does offer exposure to new audiences. I would go as far to say that sharing content on your site is the key to growing both traffic and revenue. If you share your content ethically, you will acquire high-quality visitors, and high-quality visitors will help you earn more money from advertisers. The formula above works. I have seen it used by top websites all over the world to grow their traffic and revenue. If you’re starting with a new site, stick with it, once the organic results start sinking in, things will really be rolling. If you’re a more established site, don’t cut any corners. Executing the plan above has exponential growth potential on your site. The only thing that can mess that potential up is a lazy approach to executing these strategies. Most of the info above requires very little time and effort. I recommend setting aside 3o minutes after you publish any new piece of content to ensure it is shared properly. Hopefully, you will benefit from these efforts and be able to effectively grow both your traffic and ad earnings from sharing your content more successfully. If you truly want to earn more ad revenue from your existing traffic, you should already be testing your ad combinations on a per users basis. Here’s where you can start doing this for free.